All the wrong choices for all the wrong reasons: The evidence fails to support George Osborne’s economic austerity policies – the only likely explanation seems to be an intention to rob this nation of everything possible before 2015. The more we learn of the Tory-led Coalition’s policies, the wider the gap grows between what it is doing and what it should be doing. Look at the sham psychometric tests, exposed by fellow blogger Steve Walker in a series of articles on his Skwawkbox site. It is now firmly established that the DWP – aided by the Cabinet office ‘nudge unit’ – set out to pressgang put-upon benefit claimants into taking part in a crude piece of neuro-linguistic programming – no matter what answers you provided, the test always pushed out a ridiculously upbeat appraisal of your character and then tried to get you to act according to this verdict in your jobsearching activities. The theory is that this will make a jobseeker more confident and finding a job easier. The problem is that it’s quite utterly ludicrous. If you haven’t already, you can read the Skwawkbox exposure of this particular caper on that site – there are plenty of links to it from this one. The reason it is mentioned here is that it provides a useful set of questions with which to analyse any government activity: First, is the theory behind this activity sound? Second, if that theory is being used to support a particular course of action, is that action justifiable? So let’s turn once again to George Osborne’s reasons for pursuing economic austerity, as described in the letter Vox Political received from the UK Treasury last month. Firstly, the letter warns against the perils of losing market confidence. By this, we can see that it means we should fear any downward revision of our credit rating by the credit agencies, as “a one percentage point increase in government bond yields would add around £8.1 billion to annual debt interest payments by 2017-18”. What’s being said is that a drop in our credit rating would mean the people and organisations that have invested in UK government debt (by buying our bonds) might move their funds to others, meaning the government could be faced with an interest rate rise, leading to increased difficulty in borrowing. But we know that this isn’t true. 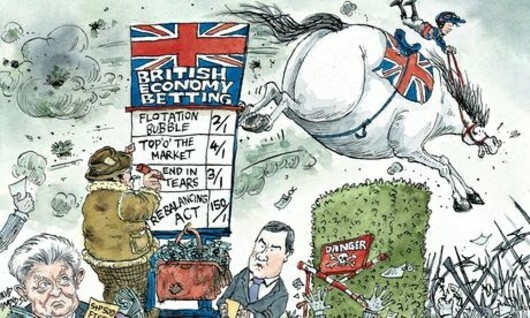 The UK’s credit rating was downgraded only a few months ago. Did interest rates rise? Was our ability to borrow hindered at all? No. There’s a reason for that. As Professor Malcolm Sawyer notes in Fiscal Austerity: The ‘cure’ which makes the patient worse (Centre for Labour and Social Studies, May 2012), “It is well-known that a government can always service debt provided that it is denominated in its own currency. At the limit the UK government can ‘print the money’ in order to service the debt: this would not take form of literally ‘printing money’ but rather the Central Bank being a willing purchaser of government debt in exchange for money.” This is what is happening at the moment. Our debt is in UK pounds, and we can always service it. Our creditors know that, so they remain happy to continue financing it. This means that the Treasury’s next point, that “any loss of investor confidence in the UK’s fiscal position would not only affect the UK, but also the global economy” is also meaningless. There won’t be a loss of investor confidence, so there won’t be an effect on the global economy. We move on – to the Chancellor’s claim that fiscal austerity is required to prevent the slowing of economic growth that happens when the national debt hits 90 per cent of gross domestic product (or thereabouts). You’ll recall that my letter to the Chancellor was prompted by the revelation that the academic paper on which he relied most often, by Reinhart and Rogoff, had been proved to be mistaken. The Treasury’s response pulled out a series of references to other academic works suggesting a fiscal cliff similar to the Reinhart-Rogoff model, off which we would drop if the national debt passed an arbitrary level around 85-90 per cent of GDP. These were published by the International Monetary Fund, which we know isn’t quite as keen on austerity as it used to be; the Organisation for Economic Co-operation and Development, which this blog marked out as “schizoid” only a few days ago; and others. Obviously I haven’t had time to look up eight academic works to support any opposing theory I may wish to create – and I think I would be foolish to try. I don’t have any grounding in economics beyond what I’ve been able to pick up by following the national and international debates. That prodded my curiosity to check some of the papers listed by the Treasury in support of its stance, and the three that I checked (The Real Effects of Debt, Public Debt and Growth, and How Costly Are Debt Crises?) all listed the Reinhart-Rogoff paper in their supporting references. So Mr Baker is right. “Debt is an arbitrary number,” he continues. “The value of long-term debt fluctuates with the interest rate… The value of our debt will plummet if interest rates rise… This means that we could buy back long-term debt issued today at interest rates of less than 2.0 percent for discounts of 30-40 percent. This would sharply reduce our debt-to-GDP ratio at zero cost. “Bonds carry a face value, meaning the amount that will be paid off when they reach maturity. This is what gets entered in our debt figure. However bonds also carry a market price, which fluctuates inversely with interest rates. The longer the term of the bond, the more its price will vary with interest rates. “If interest rates rise, as just about everyone expects over the next three-to-five years, then the market price of the bonds we have issued in the current low interest rate environment will fall sharply. Since we count our debt at the face value of the bonds, not their market price, we could take advantage of the drop in bond prices to buy up… bonds at sharp discounts to their face value. “The question is why would we do this, we would still pay the same interest? The answer is that the policy would make no sense for exactly this reason. “However, if we accept the Reinhart-Rogoff 90 per cent curse, then reducing our debt in this way could make a great deal of sense. Suppose we can buy back debt with a face value of 60 per cent of GDP at two-thirds its face value, or 40 per cent of GDP. In our debt accounting we would have reduced our debt-to-GDP ratio by 20 percentage points. If this gets us below the 90 per cent threshold then suddenly we can have normal growth again. I found Mr Baker’s piece after asking Jonathan Portes of the National Institute for Economic and Social Research (NIESR) for his opinion on the Treasury letter. He described it as “Predictable and largely irrelevant”. So despite my lack of economic education, we have a working theory that suggests the Treasury has built its economic castle on the sand; that its justification for austerity is unsound. What about the austerity measures themselves? Are they justifiable on any level at all? Let’s go back to our other friend in this matter, Prof Malcolm Sawyer. “Fiscal austerity and cuts in public expenditure do not work – there is a limited, if any, effect on reducing the budget deficit, and any return to prosperity is severely undermined.” We can see that this is true, using the government’s own figures. It managed to cut the deficit from £150 billion to £120 billion in 2011-12, mostly by axing large projects that invested in the UK economy. How much did it cut from the deficit in 2012-13? Less than £1 billion. The benefit cuts that created much of the fuel for this blog have not helped to cut the deficit at all. “The reduction of the budget deficit can only come from a revival of private demand which is harmed by an austerity programme,” Prof Sawyer continues. Again, we can see that this is true. Austerity measures such as benefit cuts and the axing of infrastructure investment projects means there is less money available to the people who are most likely to spend it – the working- and middle-classes, and those who are unemployed. People with less money have to spend just about everything they receive in order to cover their costs. That money passes into circulation and the economy grows, through the fiscal multiplier effect. An attempt to explain this effect appeared on this blog within the last few days. The point is that demand increases when the people who earn the least have more to spend. Therefore we see that Prof Sawyer’s next statement, “Deficit reduction requires investment programmes and reduction of inequality to stimulate demand”, is already proved. So the answer is to reduce the unemployment rate by creating more jobs and closing the jobs deficit, as highlighted in this blog only a few days ago; to raise incomes by significantly increasing the minimum wage and adopting the proposed ‘living wage’, as promoted in this blog frequently; and investment in infrastructure projects. What has Osborne done, along with his economically-illiterate chums? He has created high unemployment. He has cut infrastructure projects. He has, therefore, sucked all the demand out of the economy. What effect has this had? Economic growth has, in the single word of Shadow Chancellor Ed Balls, “flatlined”, borrowing has remained high and the national debt is continuing to rise. In other words, this part-time Chancellor’s strategy – a plan on which we have all been asked to judge the entire Coalition government, let’s not forget – has failed. Hopelessly. 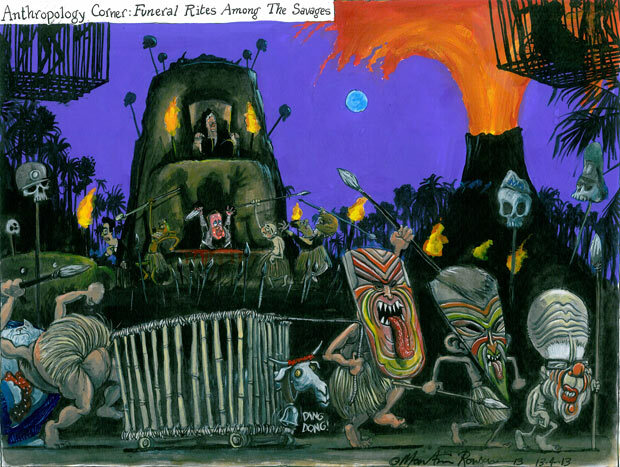 Martin Rowson’s Guardian cartoon of April 13 satirises the spectacle of Baroness Thatcher’s funeral, calling it as he sees it: A primitive tribal ritual. “This is Hell, nor am I out of it.” – Mephistopheles, Doctor Faustus. As I write these words, the funeral of Margaret Thatcher is taking place at St Paul’s Cathedral in London. Unemployment stands at 2.56 million (7.9 per cent of the workforce). The banks are not lending money. More small firms are going out of business every day. The economy is stagnant and the outlook for growth is bleak, according to the International Monetary Fund. The rich elite prey on the poor – Britain’s highest-earners are billions better-off than in 2010, while wages for the lowest-earners are increased by so little that most of them are on benefit and sliding into debt (0.8 per cent rise in the year to February). The cost of living has risen by around three per cent. 900,000 people have been out of work for more than a year. The number of unemployed people aged 16-24 is up to 979,000 (21.6 per cent of all those in that age group). Politicians lie to us, in order to win our support by deceit. Assessment for disability benefits is on a model devised by an insurance company to avoid paying money to those who need it most. Health services are being privatised, to make money for corporate shareholders rather than heal the sick. Government policies have reinstated the ‘Poll Tax’ principle that everybody must pay taxation, no matter how poor they are. Government policies mean child poverty will rise by 100,000 this year. It will not achieve the target of ending child poverty in the UK by 2020. Government policies are ensuring that many thousands of people will soon be homeless, while social housing is being sold into the private sector. And Legal Aid is being cut back, to ensure that the only people with access to justice are those who can pay for it. This is Thatcher’s Britain, nor are we out of it. She died; we went to hell. Why are you complaining? The economy is running exactly according to plan! Confirmation has come through from the Office for National Statistics that the UK economy shrank in the last months of 2012. It’s no surprise – you only had to look at the shop sales figures for December to know that something was going wrong. The poor performance has negated the effects of the growth bump in the previous quarter, when the economy improved by 0.9 per cent, boosted by the London Olympics. The official Treasury line is: “While the economy is healing, it is a difficult road.” Healing? Total growth for the whole of 2012 has flatlined. Again. If the economy was a hospital patient it would need a sharp electric shock to get it going again (but we’ll come back to that)! The total economic growth since the Conservative-led Coalition government came into power is 0.4 per cent; less than that recorded during the first quarter of the Parliament when the government was still working under Labour Chancellor Alistair Darling’s spending rules. “Today’s GDP figures are extremely disappointing, but not surprising. We warned the UK Govt their cuts were too deep, too fast,” said Carwyn Jones, the Welsh Government’s First Minister. Economist Danny Blanchflower tweeted: “-0.3% lack of growth comes as no surprise but is appalling this was made in #11 Downing Street. The question is what is Slasher going to do? Comedy Prime Minister David Cameron received early warning of the figures, and responded by having a slap-up meal with his Bullingdon chums Gideon George Osborne (the man responsible for the mess) and London’s comedy mayor Boris ‘zipwire’ Johnson. Osborne later responded: “We can either run away from these problems or confront them, and I am determined to confront them so that we go on creating jobs for the people of this country.” What jobs? In fact, this is the very predictable result of the Conservatives’ ideology-led dogma, that put a project to shrink the state ahead of prosperity. The Tories have always wanted to pin the blame for our debt woes on the state. They suggest that we are in crisis because public spending got out of control, and that this is what happens when the state gets too big. But this is a fantasy, unsupported by any sound economic analysis and designed to pursue a reckless plan that puts the economy and long-term recovery at risk. The image of a bloated state getting fatter on taxpayers’ money while crowding out a budding private sector is nothing but propaganda, and here’s why: Before the credit crunch, public sector debt was less than 40 per cent of national income – it was the private corporate sector that was out of control, with debt at almost 300 per cent of national income. The Tories wanted to say the private sector was being crowded out by the public sector, but in fact, it was being propped up by it. Those of us who listened to the experts knew that cutting would make things worse, rather than better, but we heard yesterday that Osborne is now ignoring the advice of his former bosom-buddies at the IMF and intends to keep chopping away at the carcass, presumably until there’s nothing left at all. The same experts, last year, were warning of a double-dip recession – or what legendary economist John Maynard Keynes called the “death spiral”. Now we’re facing a TRIPLE-dip. We haven’t just entered the death spiral; we’re well into it! 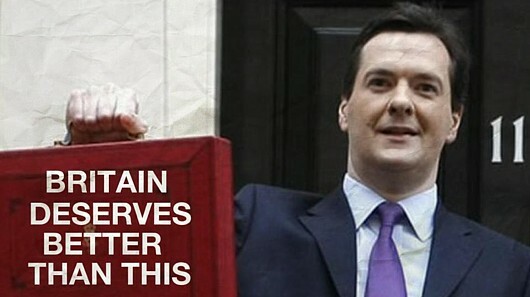 Osborne’s solution is to cut benefits and wages so that people have less money to spend on the UK economy. With less money in circulation, shops will close and businesses will go to the wall. Foreign investors will turn away from a nation where they will see there is no profit to be gained. Creditors will start to worry and our credit rating will suffer. By the next election in 2015, there may not be any life in UK business worth mentioning. Does anyone remember when David Cameron said, “The good news will keep on coming”? He’s a public relations man, you see. His skill is in saying the opposite of what he means, in order to make a message palatable to the public. You could say he’s not very good at it, because his greatest feat was to persuade the British public to reject his Conservatism a little less harshly than that if all the other Tory leaders since John Major – which is what made it possible for him and Osborne to put us all in this mess by forming a dirty backroom deal with the Liberal Democrats. I’d like to talk to some of the people he persuaded to vote for his squalid little gang of cutthroats. What would they have done, if they had know what would happen? Osborne or the IMF – who do you believe? What a day. The International Monetary Fund has politely suggested that Gideon George Osborne should slow the pace of his austerity measures; in response, Osborne has politely suggested that the IMF should go and spin on it. You are watching ‘A Family At War’. 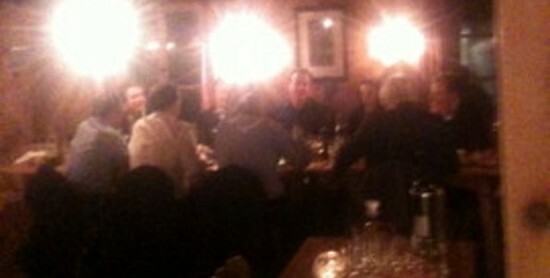 In response, Osborne said: “We have a credible and flexible debt reduction plan. That credibility is very hard-won and easily lost. My problem with the IMF is that it is the very organisation that told us our economy had a completely clean bill of health, immediately before the credit crunch, the banking crisis and the first of our recessions. How can we ever trust anything that comes out of it again? Mr problem with Osborne is that he’s, well, Osborne. Look at what he said – it’s a load of hogwash. We don’t have a credible debt reduction plan – that’s why the credit agencies are poised to strip the UK of the triple-A rating that Mr 0 prizes so much. Even The Spectator magazine – a Tory rag – has slapped Osborne’s chum David Cameron for lying about the debt. Cameron said his government was “paying down Britain’s debts” – in fact, on his watch, it has risen from £811.3 billion to £1.11 trillion (for those of you who like percentages, that’s from 55.3 per cent of GDP to 70.7 per cent). In other words, both as a percentage of GDP and in real terms, debt has risen by nearly a fifth under this government. And Osborne is the one who was supposed to turn that situation around. Welfare reform isn’t making the UK economy more competitive, it’s pushing wages down. If the impoverishment of British workers is what Osborne thinks it will take to bring business into the UK, then he isn’t fit to be Chancellor. But then, we knew that anyway. Cuts to taxes might make us more attractive to businesses, but only because they don’t have to pay as much to the government in order to operate here. That doesn’t help the UK; it helps those private businesses. So once again, we see how Osborne views his own role – as a kind of corporate vampire, sucking money out of the state and feeding it to private businesses – from abroad, to judge from his statement today. The money he siphons out of the Treasury means a shrivelled, shrunken public spending system – again, something Osborne desperately wants, as he will use it to improperly justify further cuts to services which the British public desperately need and deserve. Back in 2010, the IMF was recommending austerity and Osborne was shoulder to shoulder with its spokespeople. Now he’s showing his true colours. But then, what can we expect from a man with such poor morals he even used the Parliamentary expenses system to make a cool £1 million at the taxpayers’ expense? 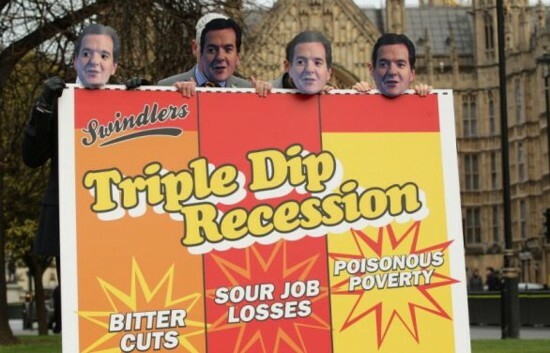 I wonder what he’ll say tomorrow, if the figures put us into triple-dip recession. Woolly mammoth to be new leader of Conservatives? ≈ Comments Off on Woolly mammoth to be new leader of Conservatives? The police welcome David Cameron to the Conservative Party Conference in Birmingham. His austerity cuts are expected to cripple forces across the country, with part-privatisation already an unwanted reality for some. So is everyone having fun atmaking fun of the Conservative Party Conference? The event has been unfortunately-timed, as it turns out a mammoth has been found, frozen in Russia, after 30,000 years. Inevitably it will be the subject of much scientific study and debate, but really, if they wanted to look at a species of woolly monsters long overdue for extinction, they need only go to Birmingham. Further evidence of unfortunate timing can be found in the International Monetary Fund’s latest report, which shows that the Conservative-led austerity policy has utterly failed to restore confidence and there is “considerable” risk of further deterioration in the economy. Its forecast for the UK in 2013, which stood at 0.2 per cent growth, has now been downgraded by 0.6 per cent to minus 0.4 per cent. That’s a lot, in economic terms. UK Prime Minister – and Conservative leader – David Cameron, said the UK economy is “slowly healing”. It is comments like this, along with the general direction of his – let’s try to call it – ‘leadership’ that probably prompted polling organisation YouGov to headline its latest press release ‘Cameron needs a miracle to win’. The poll of voting intentions shows that the Conservative share has slipped to 31 or 32 per cent – the same as in their “crushing” defeats of 1997 and 2001. Any question comparing Labour leader Ed Miliband with Mr Cameron shows significant advances for the Labour leader. Other poll results are confirmed by comments on the Conservative conference (which I have lifted from Twitter. I don’t intend to give attributions – is yours among those below?). Fewer than 30 per cent think [the Conservatives] have done a good job on health, education, transport or reforming welfare benefits: “‘We’ll end something for nothing culture’- Tory rich boys who inherited wealth and claimed disability benefits they didnt need”; “I could save 10bn by cutting MPs’ expenses, grace and favour housing, government contracts, offices that are never used etc etc”; “Labeling those on welfare as lazy layabouts is defamation of character and those responsible should face the full force of the law”. 71 per cent think the gap between the richest and poorest has widened since the Tories came to power; and by two-to-one, people think the north-south gap has also widened (Northerners themselves agree by three-to-one): “Misery to those without whilst ensuring prosperity for those who have. They don’t even try to hide it!”. Let’s look at some of the speeches. I am grateful to the Tweeter who labelled his comments on the Chancellor’s speech ‘Osborne porkies’, pointing out some of the inconsistencies between Gideon’s words and the facts. So: “Attacks Ed M for not mentioning deficit when Labour leader mentioned the debt. ‘We were straight with voters before election’ – Except about NHS, VAT increase, child benefit. ‘Blair achieved nothing in a decade’ – Except minimum wage, devolution, academies, Northern Ireland agreement etc”. Osborne’s big idea – the plan to offer employees shares in the company where they work, if they give up their rights to, for example unfair dismissal tribunals, came under bitter attack: “‘We’re all in it together’ – unless you’re an employee”; “Osborne’s shares for rights plan shows he’s never employed people. If first thing you say is ‘I want the right to sack you’, people will go”; ” So you get shares in a company… Lose your rights… get sacked with no comeback and paid pence for your shares”. His self-congratulation about London’s bus conductors attracted this: “Doesn’t mention they will cost £38 million a year and won’t be able to collect fares”; and on his comments about Labour spending: “Yes, Boris, Labour was so excessive in its spending that your party pledged to back its […] plans right up until 2008”. We interrupt our series on how to get the UK back to work for a few words about the economy: Out of the frying pan, into the fire! The IMF has downgraded its growth expectations for the UK economy this year by a whole one per cent, from 1.6 per cent to 0.6 per cent. In other words, the downward spiral that’s been going on – ever since David Cameron and George Osborne decided to halt the promising recovery we were enjoying before they came to office in 2010 – continues unabated. So austerity doesn’t work, right? My problem with this is that the information comes from the International Monetary Fund – the very organisation that told us our economy had a completely clean bill of health, immediately before the Credit Crunch. How can we ever trust anything that comes out of it again? On the ‘plus’ side, every downgrade of the UK’s predicted economic performance since the Coalition came to power has come true, as near as you like, so I think we can rely on this one. On the ‘minus’ side, this means the UK economy – our industry, our commerce, our way of life – is in one heck of a lot of doodoo. If you think we’re at rock bottom now, imagine our situation at the end of the year, with 12 months of bat guano beneath rock bottom, and us beneath that. On the very same day that this announcement came out, the government announced that it is on course to meet its borrowing target for the current financial year. As I understand it, this is the target that was revised upwards in the Chancellor’s autumn statement, and the bank levy, last January’s VAT increase and debt control measures are helping the government reach it. So austerity does work, right? The BBC even produced a Germanic-sounding pundit to underline the finding, sort of like: “Ja ja, austerity ist vorkink!” (Thank you, ‘Cultural Stereotypes R Us’, for that one). But… This is the same government that said a majority of disabled people supported its proposed ‘reforms’ of their benefits (they didn’t) and doctors and nurses approved of its plans to change the NHS (they don’t). Unemployment recently rose to a high point, in recent years, of 2.68 million – nearly 10 per cent of the workforce. How much is the government spending on benefits for these people? I feel certain that one of the above-mentioned institutions will be making an apologetic climbdown again soon. And I doubt it’ll be the IMF.